Harlan S. Hansen, PhD, is a professor emeritus of early childhood education and elementary school classroom management and discipline at the University of Minnesota. Ruth M. Hansen, PhD, was the director of curriculum and staff development for the St. Louis Park School District in Minnesota. Harlan and Ruth, both former preschool teachers, are board members of the Naples Alliance for Children in Naples, Florida, consult for Head Start programs, and conduct workshops on early childhood around the country. Give preschoolers a strong educational foundation for kindergarten and beyond. 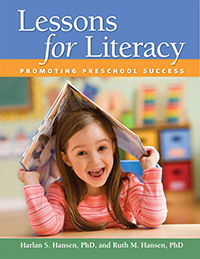 Lessons for Literacy is a comprehensive program with successful strategies to help children develop important early literacy skills such as vocabulary usage, rhyming, and letter recognition. Included is an overview of early literacy, pre-assessment checklists and tools to document progress, classroom essentials to help you identify and shape children's basic skills, information on using music for literacy development, strategies for working with families, twenty-eight lesson activities, and blackline masters.